Remove dead leaves, twigs and debris that may have built up in your yard over the winter. These are perfect homes for bugs and insects! Trim trees or bushes near your home; make sure to cut back any branches that are touching your house, as they can serve as a ‘walkway’ for bugs to enter. Fill in any cracks or gaps in windows, doorways and the foundation. Clean your kitchen thoroughly to remove any tempting food crumbs. Clean out cluttered storage areas where pests can hide. Repair any leaky pipes or fixtures; many bugs are looking for a water source. 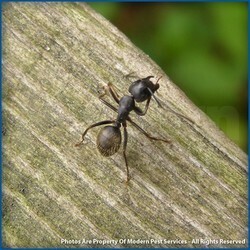 Contact Modern Pest Services for an effective year-round pest management solution. If you currently have service, tell your pest control technician thank you, and Happy Pest Management Month! Modern Pest Services has been serving New England with fast, effective pest control solutions for the home and workplace for more than sixty-nine years. We have proven our reputation by providing consistent quality services and we have been recognized by the National Pest Management Association as a QualityPro company. If you haven’t experienced the Modern Pest difference, try us for your pest control needs! Find Pest Control New Hampshire.